A very worthy addition to my DVD collection. I wasn’t quite sure it would hold up as strongly on a second viewing, knowing in advance the direction everything was headed towards. But the dramatic tension still persists, such wonderful, well prepared clashes and dances of personalities. Perhaps it’s even richer the second time around, knowing the turns Catherine’s personality will take and watching the seeds be planted. So much societal and familial repression. The four core actors are all superb. I don’t know if I’ve seen a better performance from any of them. 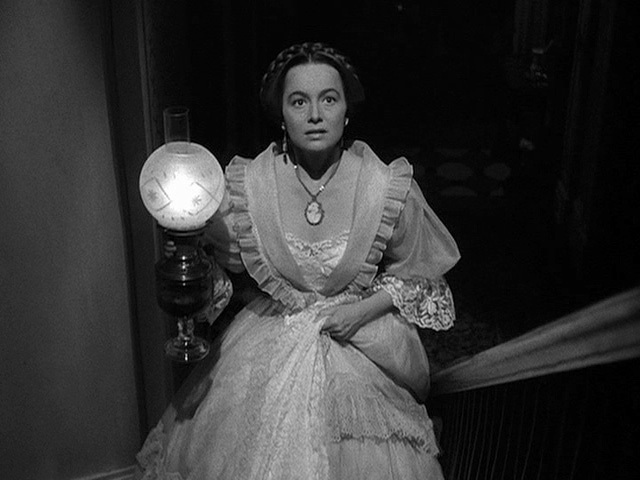 Olivia de Havilland is certainly the highlight, really nailing that awkwardness without resorting to foolish gestures or ridiculous tics. It’s all there in her timid glances and her hesitant movements, her self-esteem hanging on a thread every moment. And in the final act, the buildup of bitterness, her righteous vengeance hidden and revealed at the proper moments. Montgomery Clift is at a career high here too… I might like him slightly more in Wild River, but either way he’s splendidly smarmy and ingratiating. I like to entertain the notion that his intentions could have been perfectly pure, and everything he said was true. It’s a mighty slim chance, but it’s interesting to consider (the original Henry James story is probably more absolute on the matter). Ralph Richardson and Miriam Hopkins are both wonderful as well, with intriguing little nuances to their characters that elevate them above the standard melodrama archetypes. It’s encouraged me to check out more Hopkins, who I’ve only ever seen in Lubitsch movies and her small role in another Wyler film, The Children’s Hour. She’s got her own tragic edge to her in this picture, you sense that there’s a story behind her. This entry was posted on April 20, 2012 at 8:34 pm	and is filed under Movie Reviews. You can follow any responses to this entry through the RSS 2.0 feed. You can leave a response, or trackback from your own site. Though I haven’t seen the movie recently enough to comment on it, the original Henry James story is indeed very absolute about Morris Townsend. There’s no possibility whatsoever that his intentions are perfectly pure. I suspected as much. Thanks for the clarification!